When purchasing online, the price of a product is typically the first thing we pay attention to. Offering products for a lower price can be a great competitive advantage, especially for e-commerce. Which prices should you put in your product feeds to show up in Google Shopping results? To give you the ability to define the best prices for your products online, we have added a new sorting function to the PLA Copies report! Go to SEMrush → PLA Research → PLA Copies, then enter a competitor’s domain, and click Search. By default, the report will be sorted in descending order by the number of keywords for which each ad appears in search results. To use the new sorting feature (1), click “Price – highest first” to display an online store’s most expensive products, or choose “Price – lowest first” to see its cheapest ones. By viewing your competitors’ highest- and lowest-priced products, you can adjust your product feed with the best price to make your product listing ads more attractive for your potential buyers. You can also sort your results by the number of keywords that trigger product listing ads to appear in paid search results. The more keywords an ad has, the higher the chance of potential clients seeing it in search results. 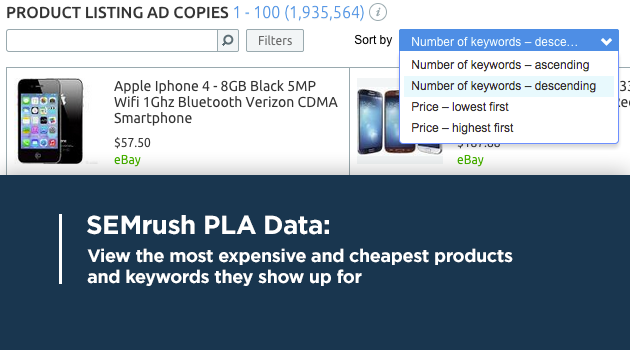 Do you also want to know which keywords are PLAs for the most expensive and cheapest products showing up for? Click on the bottom line (2) of an ad in the report, and you will see a list (3) of search queries each product listing ad appear for. 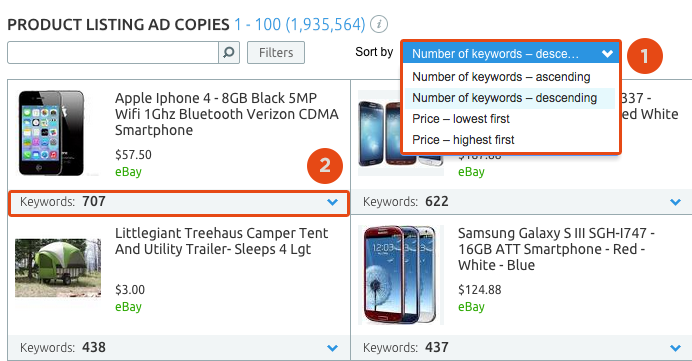 Optimize your product feed with these search terms by adding them to products’ titles and descriptions, and let your PLAs win more impressions and clicks! You can also sort AdWords ads in the Ads Copies report by the number of their keywords and see the list of their search terms. Results in the PLA Positions reports can be sorted by price.